When I was growing up, I couldn’t wait to get out of rural southern Indiana. There wasn’t anything particularly wrong with my hometown; in fact, it was quite a wonderful place to grow up— friendly neighbors, inspiring teachers, and caring friends. But I always thought I was missing out on something. “There aren’t any gay people here,” I told myself. For me, gay life was exclusive to the hip neighborhoods of New York and San Francisco. Despite my blind admiration for the costal bohemias, I wasn’t going to turn down paying in-state tuition at a great state school in my backyard. The Castro and Chelsea would have to wait. Indiana University proved a fantastic place to grow as a person and a historian. I had the pleasure to work at some amazing places like the GLBT Office and the Indiana Magazine of History. Both places helped me understand that there were diverse communities in my home state; I just wasn’t looking in the right places. To be sure, maybe Indiana didn’t have a Stonewall-like uprising or famous leaders Harvey Milk, but there were plenty of queer communities with rich histories that paralleled and sometimes contradicted the national LGBT narrative. Hoping to find this history, I stumbled upon the Chris Gonzalez Library and Archives in Indianapolis headed by founded Michael Bohr. Bohr founded the archives in the early 1990s as an effort to preserve the history of the gay community at the height of the AIDS epidemic. Bohr hoped the archives could help prevent the loss of personal materials from the victims, some whose families hoped to purge their loved ones’ connections to the larger gay community following their deaths. At the archives, I discovered boxes of t-shirts Bohr and others had collected over the years that represented the culture of LGBT residents of Indianapolis and others from around the country. I created a small exhibit featuring some of these shirts at the Indiana University Gay, Lesbian, Bisexual, and Transgender Student Support Services office in April of 2012. Wearing Gay History, an online archive of t-shirts and other clothing items in the Chris Gonzalez Library and Archive, includes five short exhibits that help contextualize the shirts centered on pride, humor, advocacy, politics, and gay life in Indianapolis. Additionally, about half the shirts can be searched through a map feature, allowing users to see how the archives contains shirts from all corners of the country, and even a little international flavor with the addition of a ball cap from Toronto’s 2003 pride celebration. The map helps underscore the connections Hoosier LGBT communities have made outside their borders, evidence that their identities are not as isolated as we might imagine. 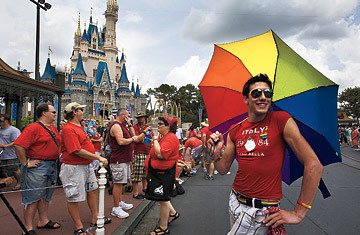 Gay tourism, civil rights marches, gay choir competitions, and sporting events, to name a few, helped connect Indiana’s queer communities to other regions and cultures. Sadly, despite being a seemingly inclusive LGBT archives, the t-shirt collection is by no means a completely fair representation of Indiana’s LGBT community. Most of the shirts in the collection allude to the culture of gay men, with very few shirts representing lesbian, transgender, or bisexual life. When underrepresented groups are highlighted in the exhibits, they are often discussed in the context of violence (Transgender Day of Remembrance) or betrayal (Mary Cheney and the 2004 presidential campaign). 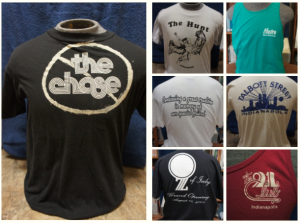 Finding more shirts from these diverse communities to add to the digital archives is imperative. I’ve been lucky enough to get in contact with both the Gerber/Hart Archives in Chicago and the Rainbow History Project in Washington, DC, both that are highly interested in getting their extensive t-shirt collections digitized and opened to the public. Their inclusion will broaden the scope of the project to include much larger queer communities, but I feel the heart of the project—to uncover ignored histories of LGBT persons through their material culture—is still in place. For more information please visit: www.wearinggayhistory.com. Eric Gonzaba is a PhD student in American history at George Mason University. He received his BA in history and political science from Indiana University in 2012 and his MA in history and women and gender studies from George Mason University in 2014. His work focuses on the politics of American popular culture in the 1970s and early 1980s.